You may not know this if you don’t know me personally. Yep, I have an addiction. I’m dependent on sunshine. Every winter, even though I do relish the cold weather and I’m crazy enough to say I enjoy snow, I start getting restless, weary, and downright grumpy come February. I owe this moodiness to lack of sunlight. Winter’s short days coupled with dreary, overcast skies that usually accompany a good portion of the season here in my homeland seem to affect me negatively. I wouldn’t go so far as to say I have SAD (Seasonal Affective Disorder) because I don’t require medication or even light therapy, but the lack of light – in particular sunshine – and even a lack of brilliant colors definitely makes me a Grumpy Gerta. Writing this post while seated at my kitchen table perusing a mostly brown, gray, and black landscape outside my window reminds me of this malady. So every February, I anxiously await longer days, more sunshine, and whine at winter’s longevity, saying, “Bring on the color, will ya? ?” I first noticed my temperament became gloomy when we lived in the Pacific Northwest where the sunshine is minimal and the rainy skies continue for a good part of the year. A wise advice giver told us to purchase a house with abundant windows, a home not located in a nest of those huge Douglas Fir trees that seemed everywhere. We moved there from the Midwest plains where sunshine abounded and trees weren’t as high as skyscrapers. During our first winter (if you could call a season without any frost winter), I noticed the ever constant overcast skies and lack of sunlight affected my demeanor. When the sun came out, my world became rosy. I was a most happy camper as my mood lightened, my steps became more springy, and my general outlook brighter. Six years later, we moved back to our home state and my hometown. Imagine my dismay to find out my neck of the woods (where winter definitely arrives) is also noted for lack of sunshine. In 49 years of weather records, our nearest city supposedly averaged sunny days only 45% of the year. Some experts claim October is one of our sunniest months, which explains why I love fall weather. And I LOVE sunshine! When the sun beams, I beam. It’s that simple. So this week, it’s been rainy and dismal and drab and gray. Need I go on? Blah. The sun appeared to be AWOL and that made me tired, apathetic, and lethargic. Really, I just wanted to crawl back into bed yesterday because it was so bleak outside. And I didn’t even feel like blogging! Yes, it’s that serious! But this morning gifted me little glimpses of sunshine literally and figuratively. Every so often, rays of light peeked out from behind the clouds and streams of sunlight flooded through my windows. Hurray! I started feeling more perky. I opened up my laptop, logged into WordPress and another little glimpse of sunshine poured into my day. 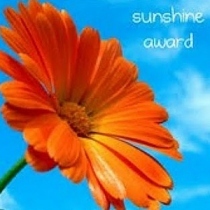 Dor over at Technicolor Day Dreams blessed me with a comment announcing that she nominated my blog for an award — get ready — the Sunshine Award! Dor doesn’t know me personally; she doesn’t know that I LOVE sunshine. She doesn’t know that my goal is to spread some sunshine and hope into this dark world. But she sees that in my posts which sends rays of sunshine into my soul. Thank you, Dor! I awakened this morning thinking I had nothing to write about today but just one or two rays of light provided inspiration. Nominate 10-12 other fabulous bloggers. Check. The difficult part is narrowing down the nominations because a myriad of fabulous bloggers exist out there. My faves listed below. Link your nominees to the post and comment on their blogs, letting them know they have been nominated. Check. That’s the fun part! Share the love and link the person who nominated you. Check. Dor, you’re incredibly kind and sweet! Favorite color: Yellow! Of course, the color of sunshine! Favorite non-alcoholic drink: Tea, hot or iced, hands down. I also like….you guessed it….sun tea. My passion: #1 – God (He created the sun and gave us His Son!) #2 – my husband and family. #3 – writing, it does give me joy. Prefer getting or giving presents: Receiving gifts is not high on my love language list, but I so enjoy giving joy to others with a meaningful gift. Favorite flower: So hard to choose!!! I vacillate between lily of the valley, lilac, and hyacinth. Bet you thought I’d say daffodils or buttercups because they are yellow! I like them too, but I love lily of the valley for their tiny, delicate blooms, lilac and hyacinth for their lovely fragrance. And now it’s time to pass the torch of sunshine to my fellow, inspirational bloggers listed in no particular order but as they came to mind. Thank you all for sending a little light and sunshine into my blogging world. I must apologize for two things though. First, I’ve mentioned several of these bloggers before (I can’t help it, they are my favorites!!) and I haven’t had much free time to seek out a lot of new blogs to read. Second, if you’ve already received this award, I’m sorry, but you are my sunshine and you deserve to be recognized again! Grace For My Mess I always find rays of sunshine at Jana’s blog as she writes about her faith and family, spreading the light of our Savior to all who read her posts. Homestead Ramblings HR was one of my very first contacts in the blogging world and she has become one of my dearest friends. Her insights inspire me and are illuminating as well. Georgette Sullins Blog Another blogger that I’ve come to think of as a dear friend. Her life stories never fail to intrigue me and make me smile. Smiling is sunshine for the soul. My Wife Doesn’t Think I’m Funny His wife may not think this guy is funny, but I think he’s hysterical. His posts always make me laugh and not being much of a humor writer myself, I admire that about him. Coming East Simply put, Susan’s posts are interesting and well-written. Seeing Beauty I recently stumbled upon this young writer and immediately sensed a beautiful soul, one who serves others in a far-off land. Stories About My Life, 92% True Jimmy keeps me updated on what happened in the 80’s (the ‘lost’ decade I can’t remember because I was too busy giving birth and raising three kids!) as he writes nostalgic stories for his family but manages to amuse the rest of his readers, me included. Big Happy Nothing Amiable, Amiable just exudes fun and just like we need sunshine, we all need a little fun in our lives too! Minding My Nest With that common theme of nests in mind, I enjoy reading Kelly’s journey coping with her “not so empty nest.” She fills her nest and blog with great pictures, awesome recipes, and creative craft ideas. These Days of Mine A day without Dianna’s blog is like a day without sunshine. Inspired Visions I’m always inspired by this blogger’s visions which are her wonderful photographs. Montana Outdoors Even when this talented photographer posts pictures of snow and ice, it warms my heart. He’s a down to earth, homespun kind of guy, one you’d be happy to call your friend. Today in my Opportunity book, I feel like I’ve been transported to sunny California. The sun is shining outside and in my heart of joy, I’m walking on sunshine. Among the many things I like about you is that you use the word “fave”!! I do love that word! Congratulations on the Sunshine Award–I like that one too, received it and am preparing to write my acceptance speech, though I’m a bit behind…. See you later–God bless you! Oooh, a wedding, how fabulous!! Sending prayers of blessing!! Oh my goodness! What were they thinking??! (That’s not criticism–just overwhelmed!) Will definitely be praying. Bless you all–what a happy year of love! LOL!! 😀 That’s what I asked them too! But I am soooo happy for all of them. Thank you so much for the nomination, it’s a real honor. I love writing and it means the world to me when people enjoy what I write. I hope to get back to being a more consistent poster. Again, thank you. Thanks for mentioning my blog; very kind of you! I get to feeling kind of drab by the time February comes along too. If it would get warm and the snow would melt, if we would have a good old blizzard, for a few days, February would be just fine, but it just gets into a drab, gray pattern. However, March is just about here and spring time in the Rockies is like hitting all of the rides in an amusement park, so the world will be fun again. Thank you so much for thinking of me for the Sunshine award! You described exactly how I feel about February. If it would get warm, that would be fine, even if it snowed a ton, that would be fine too. It’s this in between stage of bleakness that gets to me. The only bright spot of the month is my son’s birthday! And yes, March is coming. I love how you described spring time in the Rockies, Montucky!! You’re very welcome for the award, you deserve it. Thank you so much, Mama! I’m honored that you chose my blog for this award! I love the sunshine here in Texas and am reminded not to take it for granted. Just like the golden rays outside my window, your posts always warm my heart. Thank you, friend. You’ve made my day brighter! Thank you for your kindness in thinking of me. Your words always touch me and I’m honored you enjoy the family stories. You write so eloquently. I feel safe at your site knowing you will always welcome me, have a good or kind word to share or, I may leave having learned something. It is my hope to bring sunshine, good news and marvel at the beauty within our blogging community. What a wonderful entry to the weekend. Dear friend, I can hardly contain myself as I’m guessing at your exciting news!! Oh, we can take just as much joy as God grants to us and right now, He’s ‘raining’ blessings on us both!!! ♥ Have a most wonderful weekend with your kids. Thank you so much for that sweet comment about my writing. I’m missing sunshine and warm weather, too. Even though we’ve had a mild winter, I think I’m about done. When we lived in Texas for those nearly 30 years, I actually got sick of sunshine. Can you believe it? I wanted a dreary rainy day just once in awhile, and we almost never had any. Of course, we were in the midst of a terrible drought. But now I love sun. Can’t get enough of it. You’re welcome, Susan. 🙂 We lived in Oklahoma for a few years, so I know what you mean about the sun down there in the Southwest. The heat was relentless, I really got sick of that, and it was nice to get a dreary rainy day for a change. Wow! I think fate must have had a hand in this Mama… and I am delighted the sun came out for you both literally and figuratively. Your post is the one-of-a-kind thing that gives me chills (even when the sun is out). I mean when something is really really good like a concert or a song – or a blog post, I always get chills up and down my spine. It’s my thermometer for quality. Aw, what a lovely post! And such a sweet comment about my blog. Thank you SO much for passing this award to me. I’ll get to work right away on an acceptance post. It’s a perfect award for you: now when you’re feeling gloomy, you can just look at that beautiful logo on your blog! I meant what I said about your blog being like a day of sunshine and your comments are like sunbeams too, Dianna. Thank you! !